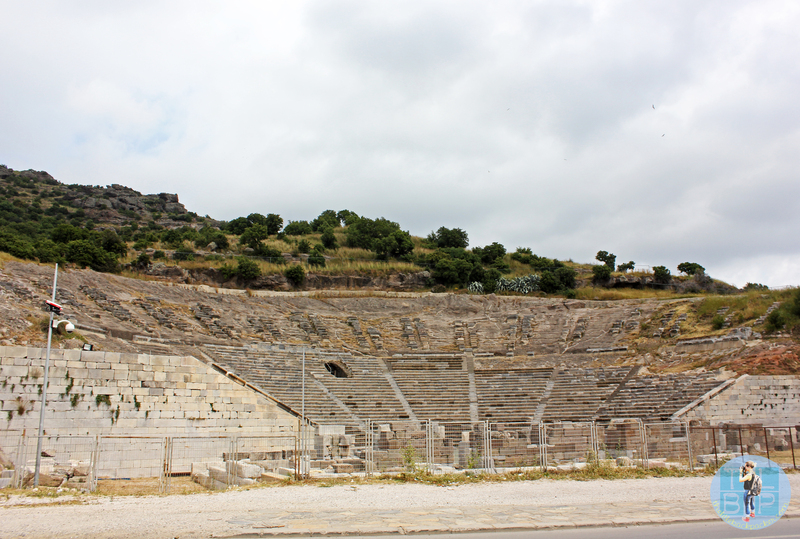 While we were in Kos in April we took a trip across to Turkey for the day. Bodrum is around 5k from the Greek island of Kos and I was really keen to see the differences between the two. I had already established that Kos had a strong Turkish influence especially in Platani – the town we were staying in but wanted to see more for myself. We took a ferry over which cost €24 including taxes – ours was called the Maria Star and I couldn’t fault their service within an hour we were on dry land in Turkey. 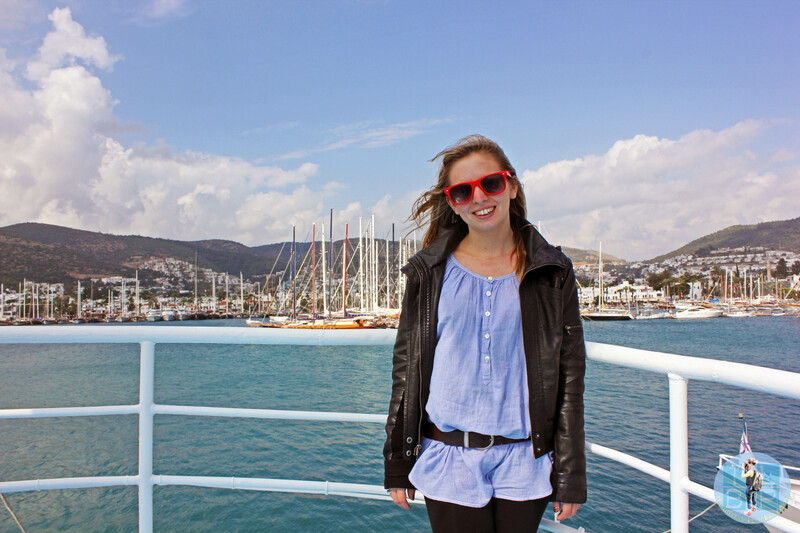 This meant we had from 10.30am – 4pm to explore Bodrum. We docked in the gorgeous harbour which was full of beautiful tall boats – very different to the sleepy harbour of Kos we had departed from. The castle and underwater museum is located right by the harbour and looked fantastic – the ticket for both was €20 each however we gave it a miss this time. After wandering around the town for a little we headed off to the Mausoleum of Halicarnassus – one of the seven ancient wonders of the world. After changing our money in a little corner shop we paid the 8 Turkish Lira to enter the ruins. The site is fascinating but also just a pile of ruins and unless you know the history (like my other half did) I’m not sure you would gain much from visiting. I really enjoyed the peace and quiet as I sat and looked over the ruins with the sun on my legs pondering the history of this place. Considering I thought the only ancient wonder I would visit would be the pyramids in Egypt I found I quite exciting too. Using a little map I had picked up at the harbour we headed for the huge theatre next, this took us on a good explore of the streets and alleys too. My is the architecture in Bodrum pretty, I have never been a lover of architecture but the cute alleys, beautiful mosques and quaint old streets drew me in. The little details of blue around the window and door frames, shutters folded back from the window and bright flowers contrasting with the painted walls. The theatre sat on the main highway and wasn’t exactly safe to get too, however from here the view over the harbour was incredible which made it worth it. Having found it pretty easy to navigate our way around we decided to check out the bazzar on our way back towards the harbour. Being a Thursday it was pretty quiet – the main day is Tuesday – still it was nice to see what was going on inside. As much as I would love to visit the one in Istanbul I’m not sure I would be able to handle the busy atmosphere. 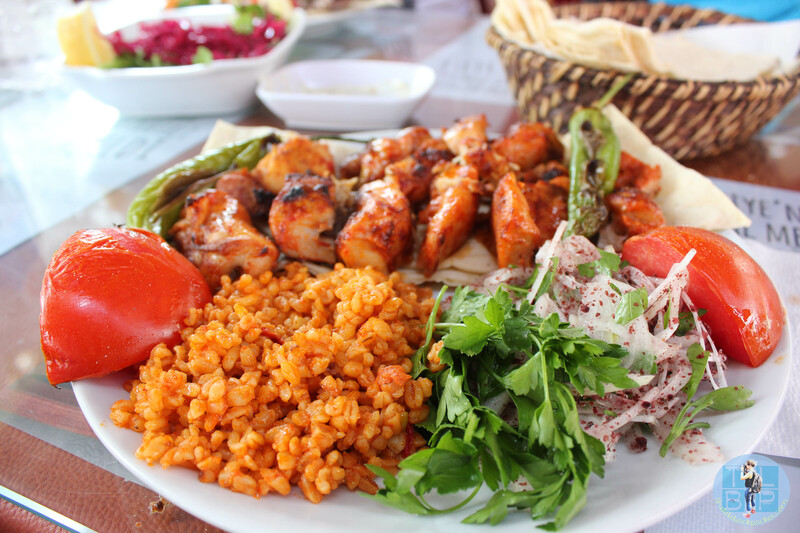 For lunch we made sure we tried a proper Turkish kebab dish – I was hoping to find a street stall but ended up settling on a little café place as I was too hungry to keep looking. Despite the menu not being very descriptive the food was fantastic but so filling! While we sat and waited for our food I watched many young men carrying around trays with tea and food on them – I was fascinated watching them go back and forth to different houses and businesses. So much of Bodrum felt familiar because of the huge Asian influence despite being the other side of the country from the border. Fast motorbikes everywhere, struggles to cross the road and haggling prices for everything just felt like being in South East Asia – I loved it. We hadn’t traveled very far from Greece but the culture certainly felt different. 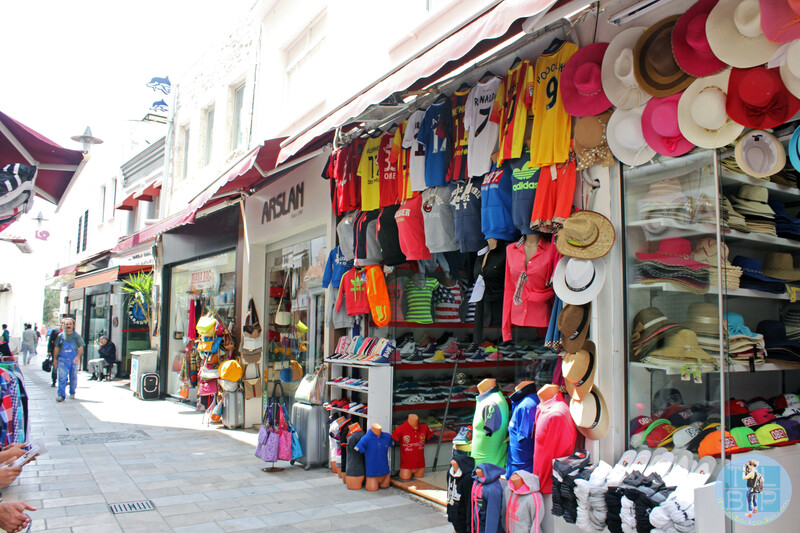 We spent the afternoon wandering around the vast amount of shops – Bodrum certainly is a shopping mecca – before deciding that sitting and drinking beer would probably be cheaper. We found a bar with tables and chairs on the beach and made ourselves comfy. While I sat and drank that beer I could easily have been in Asia if it wasn’t for the very European looking castle we were staring at. I had always wanted to explore countries close to the European/Asia border but after spending a day in Bodrum it has only increased by desire to do so. I got a real taste of what Turkey is like from my day trip here and cannot wait to explore more of Turkey. Being an EU citizen we didn’t need a visa for this trip but I would recommend checking before planning a day trip. Exchange Euros into Turkish Lira for the day – prices are much cheaper in TL – I also found Bodrum much cheaper than Kos even if you were paying in Eruos. Boats run every day from Kos-Bodrum during summer but in the shoulder season you will need to check the schedule as they aren’t so regular. 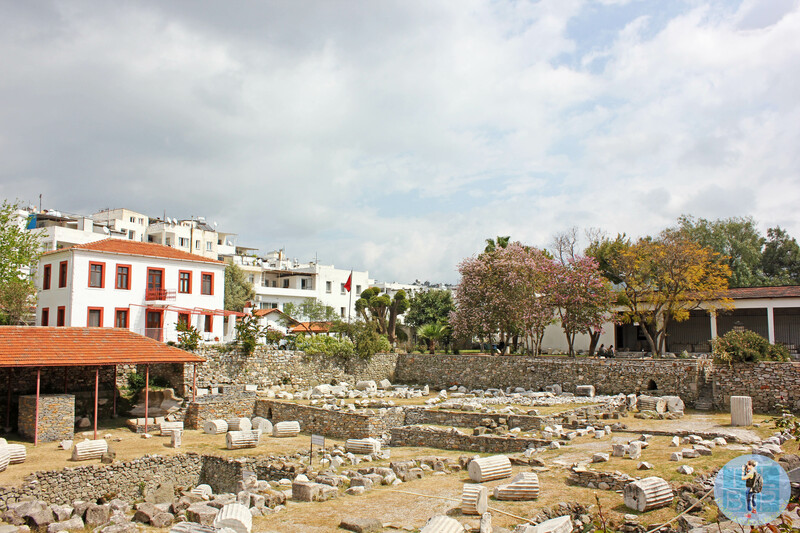 When taking a day trip from Kos it is important to check they actually take you to Bodrum – some boats drop people at a much smaller town resulting in a taxi to Bodrum. I agree it’s good idea to exchange to local currency from Euro, they sometimes can’t give you the right change and round up. That food looks SO SO good too! I really enjoyed your article, found it informative. Going to Kos soon, and thinking of going to Bodrum for the day. Will let you know if we do! I’d highly recommend the trip, we loved it!